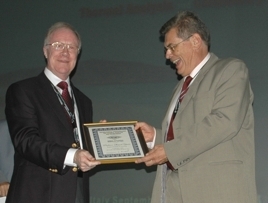 The Robert Mackenzie Memorial Lecture was inaugurated at the 12th ICTAC Congress in 2000 to commemorate the unique contribution of Robert Mackenzie to the formation and development of ICTAC. Dr Mackenzie, who passed away in July 2000, was the co-organiser of the 1st ICTA Conference in Aberdeen in 1965 and acted as President for the 2nd ICTA Conference in Worcester, USA in 1968 where the Statutes that form the basis of the Confederation were established. He was Treasurer from 1965-1980, Chairman of the Nomenclature Committee from 1965-1982 and Editor-in-Chief of ICTAC News from 1986 to 1997. In addition, he was a member of the Standardisation and Publication Committees and was Editor-in-Chief of Thermal Analysis Abstracts. Not only did he serve ICTAC in this remarkably wide variety of roles, but through his generous and caring nature, he was also a constant source of help and encouragement to successive generations of thermal analysts. As a talented linguist and tireless correspondent he provided an invaluable bridge to the scientists of Eastern Europe and the then Soviet Union at a difficult time in their history. He was also the first Chairman of the Thermal Methods Group of the Royal Society of Chemistry and made a major contribution to the long-term development of the Group. Through his work at the Macaulay Institute in Aberdeen, where he was Head of the Department of Pedology, he played a leading international role in the application of Thermal Methods to the study of clay minerals. He was very active in the Clay Minerals Group of the Mineralogical Society and served as both Chairman and Secretary. He was elected a Fellow of the Royal Society of Edinburgh and his other many honours included the first Mettler-NATAS Award in 1968, the Netzsch-GEFTA Award in 1982, the ICTA-Du Pont Award in 1985 and the Gold Medal of the Society of Analytical Chemistry in 1980. 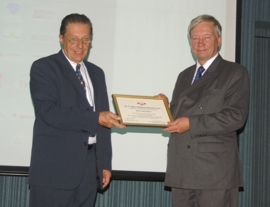 He was awarded the title of ‘Distinguished Member’ of the Clay Minerals Group in 1983 and in 1988 he became the first Honorary Lifetime Member of ICTA. The Lecture Fund was established with contributions from Dr Mackenzie’s family, friends and colleagues from around the world, in addition to those from learned societies, thermal analysis instrument manufacturers and ICTAC itself. The Lecture, which reflects the wide range of interests of Robert Mackenzie, is delivered after the Opening Ceremony of ICTAC Congresses and provides a lasting tribute to his memory.